Разновидность меха: Лиса "Arctic Marble"
The arctic marble fox (alopex lagopus forma domestica) is a farmed fox from Scandinavia. Arctic marble foxes are ideal for the production of fox fur blankets or pillows. The hair of the arctic marble fox is rather long-haired compared to other farmed foxes. The color is black and white, and the hair is dense, soft and silky. If you decide to buy a product from Scandinavian arctic marble fox, you can be sure to get an excellent and very noble natural product. 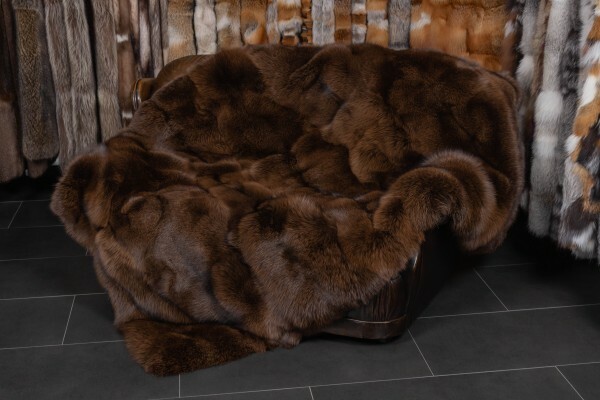 We produce arctic marble fox fur blankets, fur cushions, and accessories in our workshop in Kiel. If you have any questions or requests, please do not hesitate to contact us. Ссылки на другие веб-сайты "Arctic Marble Frost Fox Blanket in Maroon"
Оценки покупателей по "Arctic Marble Frost Fox Blanket in Maroon"
Меховой плед из норки в стиле "Ягуар"